Beverly Hill’s Nursery started in 1987 with rooted cuttings of dwarf conifers from the UNC Botanical Gardens and the NC State Raulston Arboretum. Back then we were a wholesale nursery for landscaping plants. In 2004, we decided just growing great plants wasn't enough. 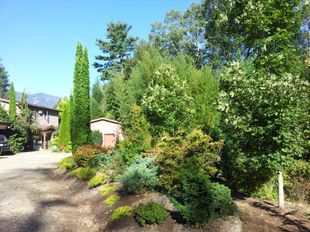 We wanted to help our customers create beautiful landscapes that meet their needs--designs that are in harmony with the natural beauty of the Blue Ridge Mountains and plants that were suited to the region. We take great care with every plant we grow, every landscape we design, and every job we work on, with the belief that outdoor areas can be a source of great joy and inspiration for you and your guests. Owner and landscaper Beverly Hill loves unusual plants and good design. She takes her inspiration from everywhere--from the natural mountain environment, to formal Japanese gardens, to seasonal perennial gardens. Her designs juxtapose color, texture and shape--creating outdoors spaces that are pleasing from every angle, in every season.